The Walking Dead's take on Prison Reform: Can Negan change? Is Negan’s stay at Alexandria’s rusted, destitute jail cell just a modern-day pillory on the public square or meant for self reflection and penance? The Walking Dead has gotten down on one knee and popped the question to viewers, “Do people change?” If you believe as Michonne that “No, people don’t change. Not really,” then any argument for letting Negan out for ‘good behavior’ becomes moot. Eye for an eye, Hammurabi’s code of law, lex talionis. There is no substitute, no action Negan can ever undertake to make up for his prior deeds from Michonne’s standpoint. It would take a literal emergency and severe undermanned defenses for it to be even plausible for her. However, if you feel like Judith Grimes that the passage of time and circumstance changed her adopted mother, then Negan’s freedom gains liquidity. Shaped in the soft motion of water rather than the rigidness of stone. Can you marry into giving another chance to Negan knowing new potential instances of ruthlessness loom based on your answer? At the same time, matrimony could see a Negan in equilibrium, rehabilitated and reformed. An active asset to society rather than a living statue of deterrence. Keep in mind, there is no correct answer for this subject. Yes or no, it’s purely case-by-case individual basis at best. Today, we’ll be taking a look at the arguments for and against keeping Negan locked away with only books as amenities. By removing Negan, you’ve created a void for another figure to possibly rise in his place. Just because Negan lost his throne doesn’t mean the demand for what he provided vanishes into the wind. The people of Sanctuary loved Negan, even after being ousted from power, his grip on the people’s sentiments remained intact. The inequality in trade he claimed elsewhere assured them a richer, better quality of life. Not to mention, his code provided structure to a society on the brink of madness and chaos. Look back at Sanctuary residents’ growing discontent with Simon and The Saviors when Negan was temporarily missing-in-action. Without Negan’s Savior whistle sending chilling fear across the land, Alpha and Beta have risen without opposition. Where the group might have been limited to a junkyard as The Scavengers with Negan to keep them in check, they’ve been allowed to develop uninhabited. People that might have become productive members of society in Sanctuary or elsewhere joined Alpha’s cause instead. By confining a healthy, strong individual from giving back to society, you’re essentially making them a net negative on resources. A drain on Alexandria’s already limited food and medical supplies as an isolated community. One that’s always on the edge of teetering on economic collapse. Really, all it takes is one random natural disaster for the entire utopia of Alexandria to come to a somber end. In Negan’s own words, he could help Michonne run the place if given the opportunity. There is no denying Negan’s leadership ability, methods withstanding. By reintegrating Negan into society, you add leadership, defense and potential to both add resources and loyal people to the community. What is mercy really? Negan referenced himself being kept alive as a public display of mercy from the great Rick Grimes on last week’s Walking Dead episode. If an individual appears sincerely ready to rejoin society, humbled and apologetic… Is it mercy to allow them a second chance to reform, or a crime against the families their deeds hurt for eternity? Rick and Michonne’s not so subtle message through Negan’s jail sentence is to keep others from doing the same. By not seeking absolute vengeance and keeping Negan alive, Rick showed the whole new world that the sun was on the horizon. No longer would an eye for an eye based society where might makes right control the land. Negan is a walking, talking symbol for deterrence. His four-by-four cell serving as a community wide memo on what happens when you break their laws. Arbitrary as they might be in the time of the apocalypse, Michonne’s charter was poised to bring about a new code of ethics. If the punishment should fit the crime as the old phrase goes… Is there any amount of time Negan can ever pay back to make up for what he’s done? Though Maggie once said the Negan she knew was already gone upon seeing him, it’s doubtful she’d want him to walk free. Even if he can make up with physical labor through willing restitution, those hurt might see any flexibility as reward. Michonne even wanted his window to the world closed off last episode (“Guardians“). There might be no emotional restitution Negan can ever provide tangible compensation for. Negan’s jail sentence in Alexandria didn’t arise out of coincidence, it’s exact retribution for the lives of Abraham, Glenn and countless others lost in the war. Although Rick ultimately didn’t go through his verbal eye for an eye promise to Negan upon vanquishing The Savior monarch, he still took away everything he had. Would you let Negan out of jail? Tell The Natural Aristocrat in the comment form below! Ezekiel pulling Daryl aside to talk Carol was The Walking Dead equivalent of getting a stiff handshake from a girl’s boyfriend. 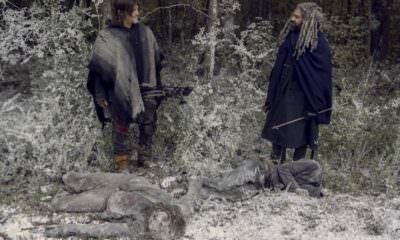 The Walking Dead’s season 9 finale saw Ezekiel engaging in a icy man-to-man talk with Daryl about his then Queen/fiancee Carol. One that boiled down to ‘Step away from her friend,’ or in Ezekiel’s words, “I don’t want to be the bad guy here.” It was universal, every guy has been on both sides of the equation at one time or another. Usually, it happens on a night out at a bar when a guy converses with a girl at length, and her boyfriend’s eyes dart to his opponent with a fierce unspoken gaze. There Ezekiel was still reeling from the death of his adopted son, when he spots an unexpected, potential challenger to the Queen’s heart from the corner of his eye. The same individual he inadvertently blames for failing Henry, his faith in him at an all-time low. At first, he makes nothing of the conversation between old friends but Daryl’s mere presence gets to the King. As Ezekiel senses the Queen’s feelings for him are slowly evaporating, he decides to secretly negotiate an exit with her possible old flame. An ember that never truly stopped fully burning and can reignite at any second. Ezekiel calls forth a seemingly friendly audience with Daryl so they can discuss matters in private. Dropping pleasantries, Ezekiel tells Daryl, he should probably leave them be when they arrive at Hilltop. No Carol around, no need to pretend, ‘We’re all best of friends here!’ However, the young lion does not accept, roaring back, “Is that what Carol wants?” The elder lion sensing the matter not closed, responds, ‘It’s what we both want!’ with a flash of teeth. Daryl understands the message, there’s nothing more that needs to be said. However, Queen Carol notices something is amiss during the man-to-man dialogue. Her feelings dwindling further, spiraling into romantic abyss with every extra second of the private conversation. Her fiancee Ezekiel’s charged body language toward her ‘friend’ has a reverse effect. Instead, Carol’s feelings grow even stronger for Daryl subconsciously. Unfinished business, the one who got away, lingering emotions that never saw closure swim up to the surface. By the conclusion of The Walking Dead’s season 9 finale, Ezekiel’s attempt at a ‘stiff handshake’ with Daryl has backfired tremendously. The move combined with the loss of their son, sends Carol to join Daryl back in Alexandria, miles away physically from the King. Practically another state in these new times. No longer is the situation just emotionally distant for the distraught King. Queen Carol returns the ring that promised a forever union to the palm of the King’s hand. Now at rock bottom, Ezekiel realizes his last minute attempt to rescue the relationship was wholly unsuccessful. By the time Ezekiel understood the building blocks of marriage were crumbling, it was already too late. Enjoyed Negan’s redemption story on The Walking Dead’s season 9 finale? Check out The Walking Dead’s take on Prison Reform: Can Negan change? for the pros and cons of letting Negan out of his Alexandria cell permanently!